(Newark, NJ – March 20, 2018) – America’s SBDC New Jersey will join with the other 49 states’ SBDCs across the nation to celebrate SBDC Day (#SBDCDay) on Wednesday, March 21, 2018. Nearly 1,000 offices nationally are collaborating in promoting the core mission and successful outcomes of America’s SBDC program via social media and live business events. Governor Phil Murphy and Lieutenant Governor Sheila Oliver signed a Proclamation acknowledging #SBDCDay on March 21, 2018 and the impact of the SBDC program, following in the footsteps of other states’ governors nationally. Very recently, the Administration heard directly from some of SBDC’s clients in different industry sectors. The clients shared their stories on how the NJSBDC assisted them to increase sales revenues, obtain procurement contracts and financing, enhance their business operations as well as create and save jobs. The Murphy Administration also received data on the program’s return on investment and economic impact for 2017 from the network’s chief operating officer and associate state director. 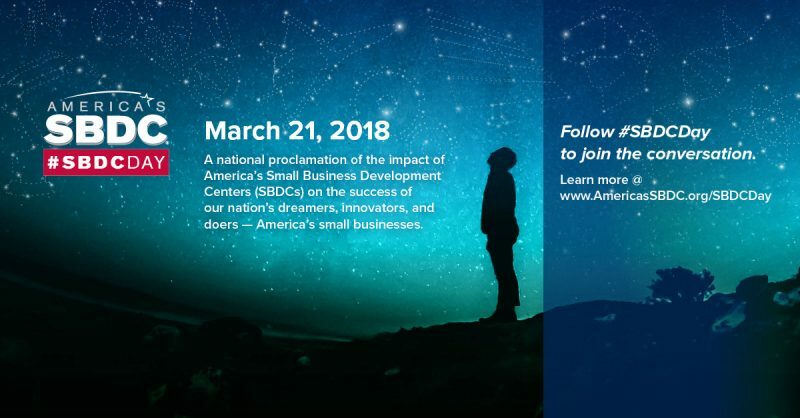 America’s SBDC New Jersey, also known as the New Jersey Small Business Development Centers, has scheduled many events/open houses on #SBDCDay. The program has notable impact on the lives and direction of entrepreneurs and small business owners. SBDC helps clients generate jobs, create new businesses and catalyze economic development in communities across the U.S.
-At the NJSBDC at Brookdale Community College (Monmouth & Ocean counties), clients will participate in a Twitter campaign concerning how the regional center has assisted them in achieving success. SBDC clients were invited to send in short videos that will be placed on the Center’s social media platforms, providing a business description and what they like best about the SBDC program. Webinars on business topics being offered will be posted. -At the NJSBDC at Kean University (Union County) is holding a “walk-in” day where nascent entrepreneurs and small business owners can mingle with SBDC staff to learn about SBDC’s services and how the program can assist them. -The NJSBDC at New Jersey City University (Hudson County) is holding a business planning training event on the eve of #SBDCDay at City Hall in Jersey City on March 20th in collaboration with the Jersey City Economic Development Corporation, JCEDC (12-2:00 pm). -The NJSBDC of Northwest Jersey (Morris, Sussex, & Warren counties) is sponsoring webinars on issues like in-bound marketing to help not only attract visitors to a business website, but, converting them into customer leads (9:00 am); human resource issues in the workplace (10:00 am); small business loans (11:00 am); B-GAP (Business Growth Accelerator Program) for high-growth clients, $1M>revenues and/or 10>employees, (2:00 pm); and government contracting (3:00 pm). -The NJSBDC at Ramapo College of New Jersey (Bergen County) is hosting a special session concerning SBDC services for the College’s graduate and undergraduate students who would like to pursue entrepreneurship as a career path. The regional SBDC is also holding an Open House for small businesses in the county to demonstrate how “Growth Wheel” software can help them better plot, monitor, and manage their business operations. -The NJSBDC at Raritan Valley Community College (Hunterdon & Somerset counties) is sponsoring “Tell us Your SBDC Story” campaign while SBDC staff instructs participants on how to post their business stories on the Center’s Facebook and Twitter accounts. The Center will also host a Twitter chat with those who respond to the SBDC Day invitation. -The NJSBDC at Rutgers-Camden (Burlington, Camden, Gloucester, and Salem counties) is featuring up to four clients on social media (Facebook, Twitter, LinkedIn) to illustrate how the program helped them with bigger impact; includes a Yoga studio, Salt bath spa, and the Center’s 2017 Success Award Winner DoveLin Enterprises, Inc.
-The NJSBDC at Rutgers-Newark (Essex County) is hosting an SBDC Day Lunch and Learn networking event at its Center office. The event focuses on stakeholders and partners including Essex County Libraries, Chambers of Commerce, and Downtown Business Improvement District partners concerning SBDC services, resources and opportunities for mutual collaboration. -The NJSBDC at Rutgers-New Brunswick (Middlesex County) is sponsoring a workshop session on QuickBooks to support business financial learning and maintaining financial information in an accessible and useful way. -The NJSBDC at Stockton University (Atlantic, Cape May, and Cumberland counties) will be promoting SBDC Day and the SBDC program on social media platforms; will provide updated information about the Center’s past client Success Award Winners. The Director will also be speaking with students at Stockton University about how they may tap SBDC services to start their own business. -The NJSBDC at The College of New Jersey (Mercer County) will be engaging on a client SBDC Day rally through social media, posting business operational articles for clients’ consumption and offering a complimentary Constant Contact Trends workshop. –The NJSBDC at William Paterson University (Passaic County) has scheduled a workshop on “Opening Your Store on Amazon and EBay” at the Hamilton Club in downtown Paterson from 10:00 am to 1:00 pm. Beginning at 2:00 pm, videos of SBDC clients will be taped to enable them to describe their business and how SBDC helped them so they can post on their business websites, too. Clients are calling for appointments at the SBDC Paterson office and there will be refreshments served as part of its Open House. Visit www.njsbdc.com, to navigate directly to centers’ regional websites (for event schedules). The New Jersey Small Business Development Centers network, one of the first pilot projects in the nation, has provided comprehensive services and programs for small business in New Jersey for 40 years; SBDC experts help businesses in 21 counties to expand their operations, manage their growth, or start new ventures. Expert staff and practicing business consultants help small business owners and entrepreneurs to develop business plans, find financing, accounting and financial analysis, identify new markets, initiate marketing strategies, find procurement and international trade opportunities, learn green sustainability practices, commercialize technology and develop an E-commerce presence. This non-profit network, a federal-state-educational partnership, leverages funding from the U.S. Small Business Administration (SBA), the N.J. Business Action Center, private sector sponsorships and additional private/public grants. The NJSBDC network Headquarters, located at the Rutgers Business School in Newark, NJ, oversees the statewide program which is an accredited member of the national network of America’s SBDC. Up to 1,000 centers and satellite offices serve small businesses across the country, generating jobs, new businesses and economic development. Visit www.njsbdc.com.